We do not have any puppy classes scheudled at this time. Our levels program and our Beginner classes are great for dogs of all ages, even young puppies, so we hope to see you there. 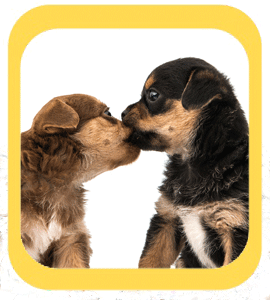 A: Yep, you are invited to bring your puppy to All About Dogs in Woodbridge for up to three consecutive puppy socialization classes absolutely free. Q: Why are you offering free classes? A: All About Dogs is committed to helping families give their puppies the skills they’ll need to grow up happy, confident, and well behaved. Early socialization, properly done, can have a profound effect on your puppy’s adult behavior. Q: Is my puppy eligible? A: If your puppy is under 16 weeks old, healthy, and has all of his or her age-appropriate vaccinations, you are welcome to sign up. Class size is limited so register and provide your puppy's documentation early so you are sure to get in. Your registration is not considered complete until we have reviewed your shot records and intake form so please hurry. We will send you a letter with the dates you can bring your puppy to classes once we have reviewed your registration, vet records, and intake form. This invitation will be based on openings in the class so you may have to wait to get started. NOTE: It's important for all puppies to have a clean bill of health before attending any classes. After registering, send your puppy’s veterinary record (with vaccination dates listed) to All About Dogs by fax (703-297-4406) or email (info@allaboutdogsinc.com). We must have these records no later than close of business on Friday before your first class. If we do not get them in time, you’ll have to wait until the following week to join the class if there is room. No exceptions. Q: Will I lose my spot if I registered but forgot to submit my puppy’s shot records? A: Yes, unfortunately we can’t hold your spot in class if you haven’t presented acceptable shot records. Records are due by Friday the week you register in order to be included in class the next Monday. If for some reason you are unable to provide them in time, be sure to let us know before missing the deadline so we can save you a spot in the next week’s class. Otherwise, since space is limited we will have to invite someone else in your place and you lose your eligibility. Q: My dog is too old for puppy class, what should I do? A: Our free puppy socialization class is only for puppies up to 16 weeks. If you miss it, or want more, don’t worry; we have lots more to offer. Our group classes in Woodbridge (called Levels) or Basic classes in Springfield are perfect for dogs and puppies of all ages. Q: Why can't I start class if there aren't enough dogs under 16 weeks old? A: Part of the reason we offer puppy socilization class is so that young puppies can learn to play with other dogs while also learning valuable lessons under the supervison of experienced trainers. If we don't have enough dogs, the focus changes from socializaiton to training. Of course we hope we have enough dogs to get started so we'll keep you posted once you register for as long as your dog is under 16 weeks old. If you miss it, your dog can still benefit from joining our group training classes in Springfield or Woodbridge.